July 24, 2014 By John Mattera & filed under All Articles, Rifles & Carbines, Weapons. The thought of a new black rifle exciting me was a foreign concept. I’m just old enough to have grown up with them and seasoned enough to have experienced most every iteration—from the original SP1/M16 through our modern chopped and channeled variations. What we have now in the AR-15 platform is a true user-friendly tool. Eugene Stoner was a genius: He built a space-age tool for the 1950s, but he was a product of his time, an engineer, not a gunfighter. So, 60-plus years after the black rifle’s inception, we now have what Stoner should have designed. Gone is that useless carry handle, barrels have been knocked down to a more reasonable length and weight, and that long fixed stock has been replaced with a collapsible unit, engineered for better function. Through the dust and smoke of NSRs, long-time EAG shooting disciple John F. puts BCM #126 through its break-in paces. Innovations are most frequently a product of necessity, oftentimes slow to develop. If we are not shooting, guns don’t break down and problems rarely occur. The terrible truth is that war is our best weapon developer, and battle carbine advancement excels during times of conflict. The last decade of war has seen the greatest improvements to the AR-15/M16 family of weapons in its history. When Pat Rogers told me to put a couple of magazines through EAG carbine #125 during a break in a carbine operator’s class, I picked up the gun with only middling interest. True, it was a Bravo Company Manufacturing gun, and I know BCM tools to be of superior workmanship and reliability. Still, at the end of the day, a black rifle is a black rifle. Where all the business takes place: KeyMod rail system over mid-length upper and BCM Battle Comp helps tame the beast in this little carbine. As I grabbed the carbine and made it to the 25-yard line, the first obvious truth was that the rifle was very light. I have always been a proponent of light rifles, as I carry them much more than I get to shoot them. Settling into my best gunfighter stance, I started with a few two-round drills—and the carbine didn’t move! It didn’t buck, push, flip or twist around in any manner. The muzzle stayed in the center of the target. Was it the mid-length gas system, the BCM Battle Compensator, the magnesium KeyMod™ upper, or some other magic too far above my pay grade to figure out? 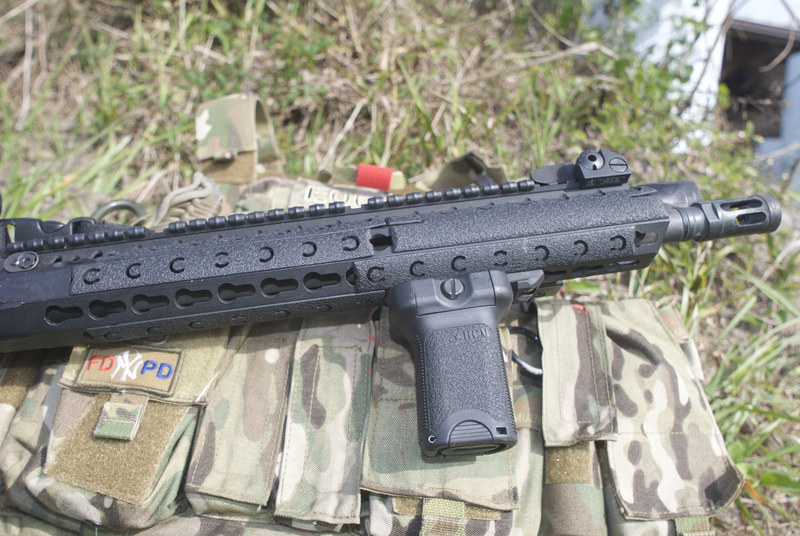 Mike Fisher of Magtech sends rounds downrange with BCM #125. I’m not an advocate of shooting NSRs (Non-Standard Responses) at 25 yards from my target, as I know all too well the liability for an errant round. Once a bullet is fired, it has no social conscience and can do terrible things if it misses its intended point of aim. But since my only liability was a 12-foot earthen berm, I stepped on the trigger. Not once but twice, then took the discomfiting walk to the target line. Today was not a day for eating humble pie. All the rounds were well within the center of the EAG target. Surprise was replaced by enlightenment. Back to seven yards for some more NSRs, where illumination morphed into the need for education. It was a short walk back to the staging area, while students sat around eating lunch and jamming magazines, and I had one single purpose in mind as I strode to my truck. I turned on my cell phone and called Paul Buffoni at BCM. I needed to know why. BCM EAG #125 Mod 1 carbine ready to go to work. This is an evolutionary step in carbine development. Certainly not needed by all who own or shoot carbines, the appeal and practicality of this tool are for a specific market. This is the tool of a gunfighter. Paul answered his cell phone on the second ring. “I’m glad you like it. From the very beginning, it was a cumulative effort. I wanted a very strong but lightweight rail system that could more easily accept non-critical mission-specific items such as sights and MFAL, without adding to the bulk of the MilStd1913 rail. “Why it is so forgiving to shoot compared to a traditional carbine?” I asked. I thanked Paul for his time and the revealing information, and walked back to the class with a completely different thought process than what I’d woken up with that morning. Buttstock used is B5 Systems SOPMOD Bravo Stock. Pat Rogers believes this stock offers best feel of any current stock. As far as the weight-versus-recoil question goes, Bravo Company has somehow figured out the carbine secret of the universe. The heart of the new system is the KeyMod lightweight 13-inch aluminum/magnesium alloy rail. 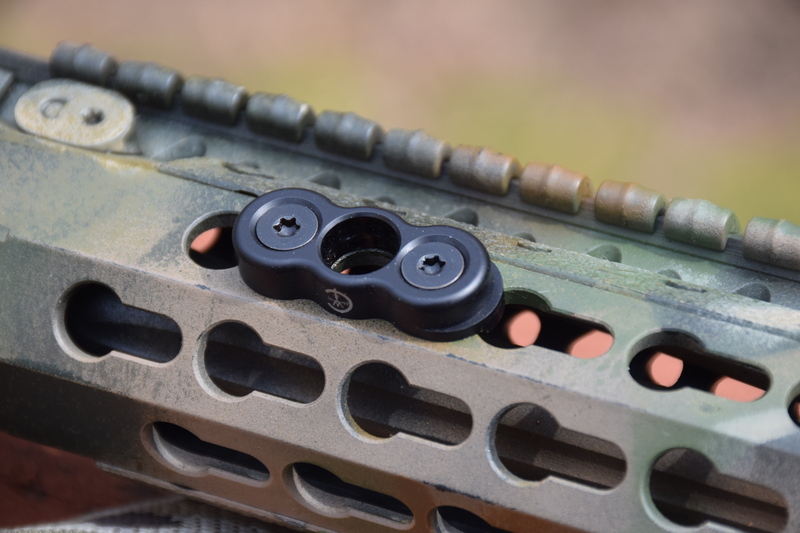 Weighing in at only 7.7 ounces with the barrel nut, the difference is immediately apparent the first time you put your fists around the BCM EAG Mod 1. The current barrel used for prototype (#125) is the 14.5-inch standard weight tube, but a lighter weight profile barrel will be available for production models. The KeyMod interface system was developed by Eric Kincel, Director of BCM Product Development, and designed to work parallel to the current 1913 rail system. Additional modular accessories will mount to the KeyMod instead of the 1913 rail, allowing for a lighter, cleaner, and less bulky system. The Mod 1 comes with all the bells and whistles, save any nonessential nonsense. She’s a lean, mean fighting machine. 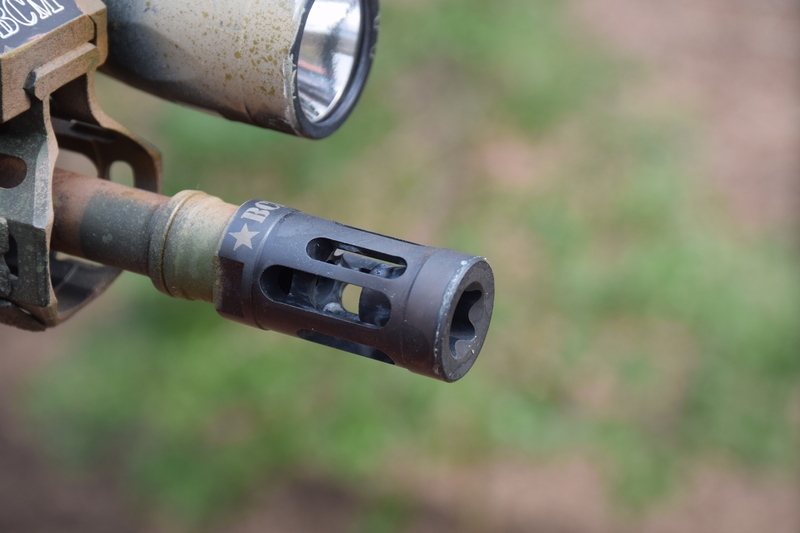 Muzzle is tipped with BCM Gunfighter Compensator Mod 1. It has a B5 Systems SOPMOD Bravo milspec stock, folding front and rear iron sights, BCM Gunfighter KeyMod Vertical Short Grip that rides under the rail panel, BCM Gunfighter Mod 3 pistol grip that changes the whole grip dynamics for shooting (and in no small part for absorbing recoil). The BCM Mod 4 Gunfighter charging handle is of course standard, with IWC KeyMod sling swivel up front and Tango Down PR-4 sling swivel in the rear. The entire rail is coated in a KMR finish that was developed for the aerospace industry. This plasma deposition process creates a stabilized ceramic-like coating on the surface. The finish offers superior wear resistance and holds up well under hard use compared to anodized or hard chrome finishes. Plus it looks great doing it. Front sling attachment is by means of IWC limited rotation KeyMod mount. This item mounts directly into the KM13 rail, so a separate 1913 rail interface is not needed. 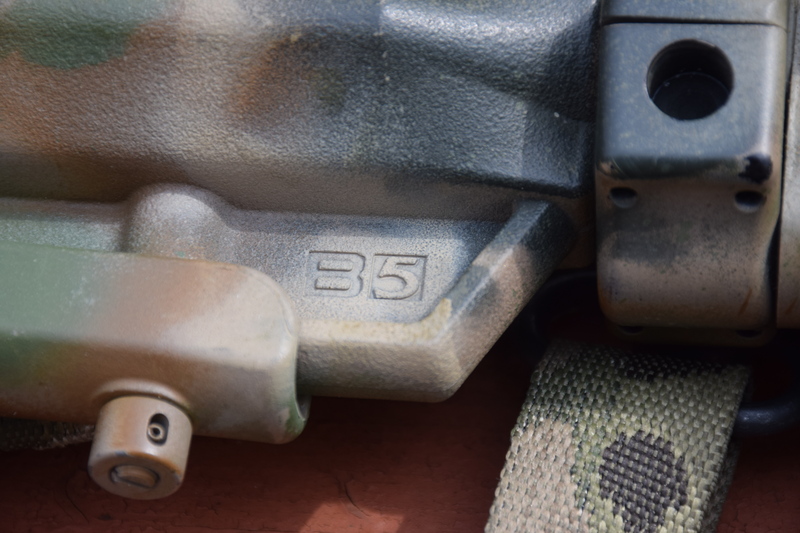 While the mission propels the need as far as accessories go, for my world lighter is better, so the only essential gear I would need to hang on the carbine is the same as gun #125 sported. A good white light and mount are necessities, as most gunfights don’t happen at high noon on blue-sky days. Gunfights happen at night in darkened hallways or anyplace else evil people lurk. 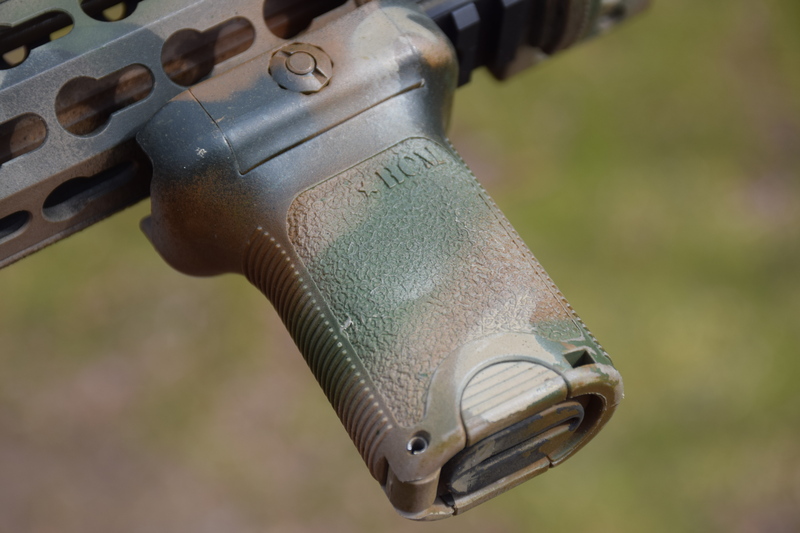 A setup like the VTAC light mount and SureFire EAG P2X Fury light is about as good as it gets. Next up, a good red dot scope like the Aimpoint T-1 is a must. I like the T-1 because it’s bomb proof, or more appropriate for our conversation, Pat Rogers proof. If it can be broken, Pat can break it. As a matter of course, he starts every optic lecture by bouncing a T-1 off the deck to show just how tough they are. SureFire P3X 1000-lumen light resides in a Viking Tactics Mount. 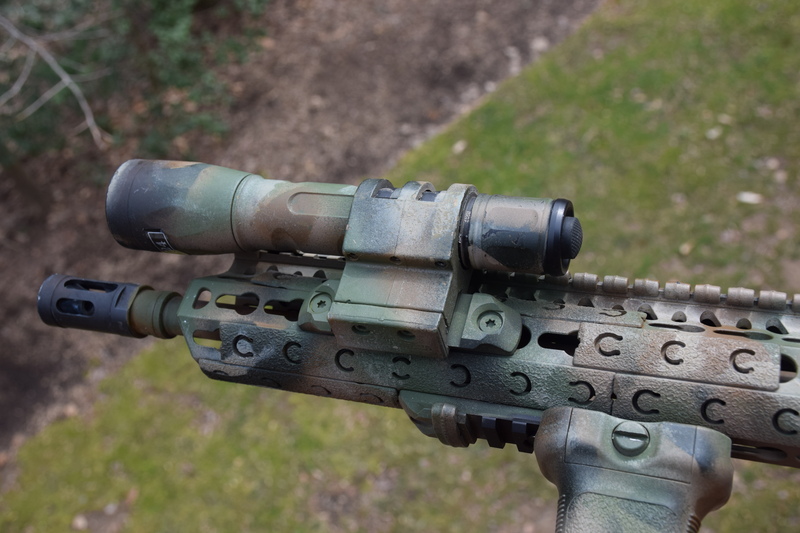 Until a KeyMod mount is made for it, it depends on a 1913 rail interface. 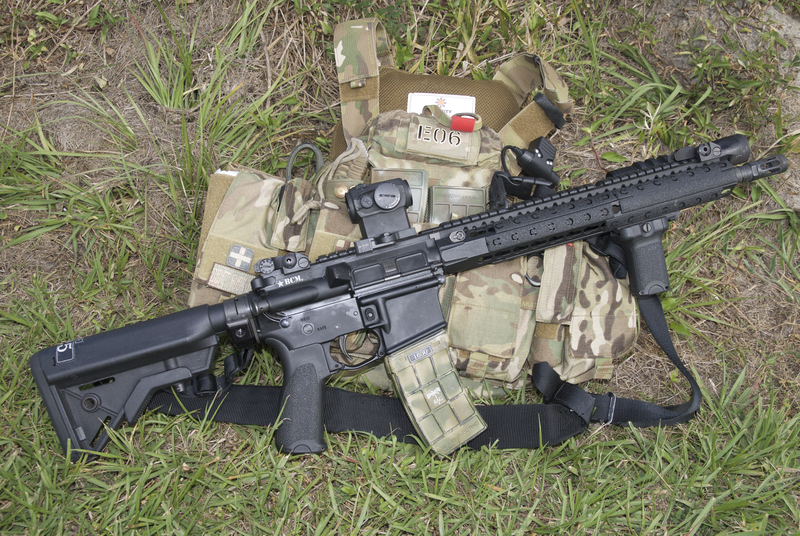 EAG Tactical classes may well be the best test bed for carbines this side of the Middle East. The targets are paper, but there are a lot of them and plenty of students lining up to shoot the new BCM EAG Mod 1. Number 125 currently has in excess of 13,000 rounds downrange. It was my good fortune to have three very capable gunslingers put the Mod 1 through its paces during two back-to-back EAG carbine classes. First up was Dave Lane, a very solid shooter who smoked the course with the carbine. Mike Fisher, director of LE sales at Magtech, had the chance to send a bunch of rounds downrange as well. Mike is a carbine operator of the first order and shot high overall in the three-day class. Three weeks later on the St. Johns Sheriffs Department range in St. Augustine, Florida, I watched my longtime hunting partner John F. wring out the little carbine. The mechanic and the tool again performed exceedingly well. 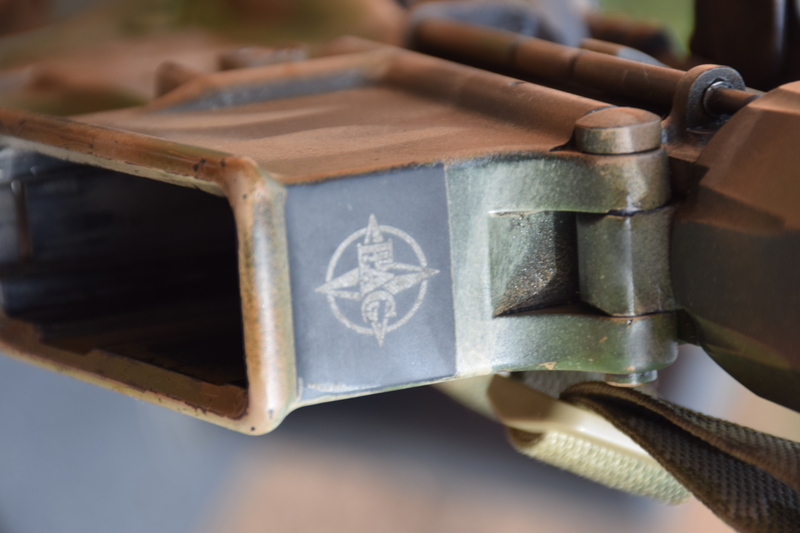 Lower receiver has EAG logo on front of mag well. Dave, Mike and John sent almost 4,000 rounds into targets without a hiccup. 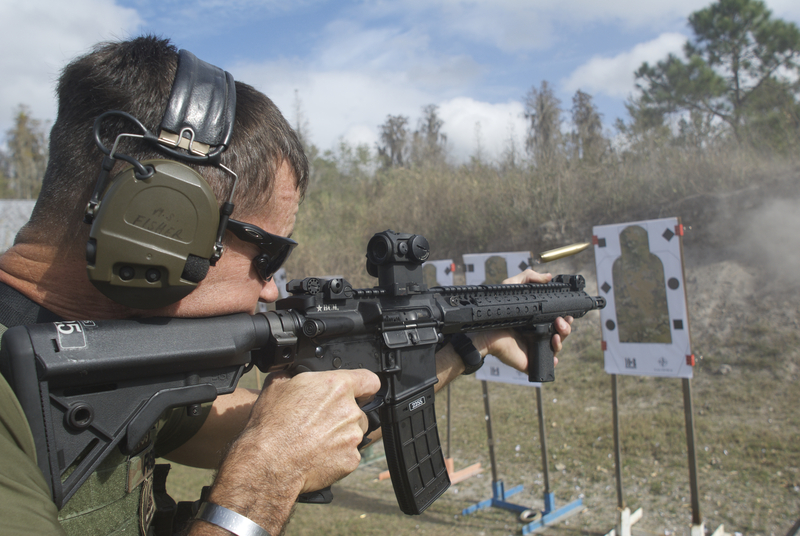 A carbine can suffer hard with multiple drivers during an intensive three-day course. Just think of how well you treated your last rental car. However, it’s not a free-for-all. All evaluation is done in an orderly and stable fashion to validate the concept and the system and record the performance. Round count is exact, and every time the carbine is broken down, cleaned or lubricated, it is recorded. Any carbine this cool is worth having two of, especially in Pat Rogers’ world. Mod 1 #125’s new stablemate #126 had just joined the EAG inventory in time for the St. Augustine class. I had the opportunity to watch John doing an impressive job of sending NSRs downrange toward the cardboard terrorists who tend to congregate in front of the berm. It’s the same carbine sans the black finish: this one is sporting very cool camo gilt. Gun utilizes BCM Vertical Short foregrip. 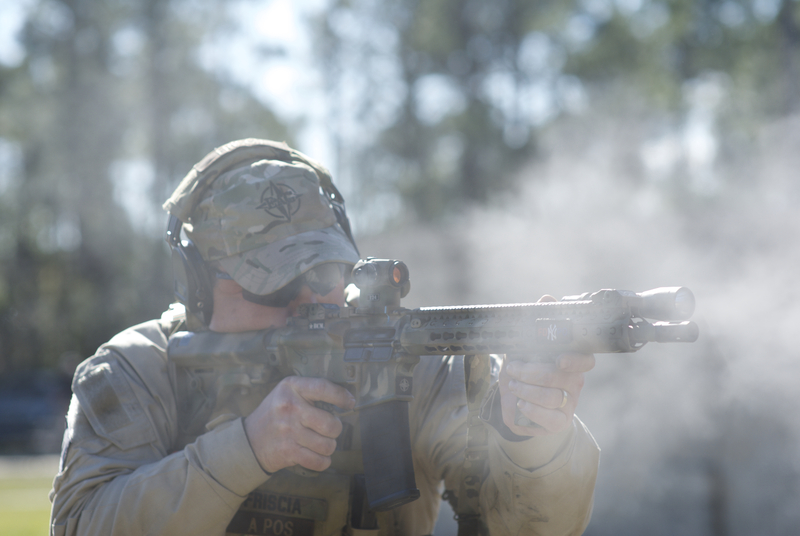 During the next EAG Basic Carbine class, at the Pinetuckey Club in Augusta, Georgia, #125 developed some intermittent feeding issues at about 11.5K rounds. Class Assistant Instructor Suzanne Cosentino took it on the side, fired several rounds, analyzed the malfunction and discovered a broken hammer pin. The pin was quickly replaced and the carbine was singing again a few minutes later. Now that I have all you gunfighters’ hopes up, the good news is that the BCM EAG Mod 1 should be available as you read this. However, this current Mod 1 configuration is still in the prototype phase, with numbers 1 and 2 being tested. Some specifications may be changed depending on performance and preference during field evaluations.